Choose the SIGGRAPH 2019 registration category that best fits your schedule and budget, and register now! For maximum savings, be sure to register before 7 June, 2019. SIGGRAPH 2019 provides several registration categories to fit a variety of access needs. Explore what’s included with each registration. Convince your boss to send you to SIGGRAPH 2019 with our justification letter that you can customize. Cancellation requests for refunds must be made in writing and received on or before this date. There is a refund processing fee of $75. Email refund requests to SIGGRAPH 2019 Registration Management. No refunds will be issued after this date. Exhibits Registration (formerly Exhibits Only) registrations are not refundable. Two interactive days of sessions, networking, and exploration of trending and future technologies that will change the way we do business. The Business Symposium will take place at the L.A. Grand Hotel Downtown. Super-size your Business Symposium registration by combining it with Full Conference Platinum or Full Conference registration. * Includes a one-year membership to ACM SIGGRAPH. ** Includes the Computer Animation Festival Electronic Theater Ticket (Monday). This comprehensive registration package will heighten your SIGGRAPH 2019 experience and ensure you’re front and center for the most popular sessions. Full Conference Platinum registration is limited. In addition to access to all of the Full Conference content, Full Conference Platinum registration includes early access and exclusive entrance to many sessions and experiences, as well as a welcome gift and many other platinum-only amenities. Includes admission to ALL conference programs, events, and experiences during the full week of the conference, as well as the exhibition (Tuesday – Thursday). Includes one-day admission to conference programs, and events, and experiences as well as the exhibition (Tuesday-Thursday). Does not include the Business Symposium, Electronic Theater or Reception ticket. Includes admission to experiences, the exhibition (Tuesday – Thursday), and select presentations and sessions. Does not include Electronic Theater or Reception ticket. Includes admission to experiences at SIGGRAPH, the exhibition (Tuesday-Thursday), and select presentations and sessions. Does not include Electronic Theater or Reception ticket. Includes admission to the exhibition (Tuesday-Thursday) and limited sessions and presentations. The reception is included with Full Conference Platinum and Full Conference registrations. Must be pre-ordered by 5 July and picked up in Los Angeles at Merchandise Pick-up. The Conference Proceedings USB contains documentation of work presented at the conference. PDFs and supplemental material (videos, still images, source code) from the following conference programs: Appy Hour, Art Gallery, Art Papers, Computer Animation Festival, Courses, Emerging Technologies, Panels, Posters, Production Sessions, Real-Time Live!, Studio, Talks, Technical Papers and Virtual, Augmented and Mixed Reality. Order this product before the conference or onsite, and it will be delivered to you by Monday, 16 December 2019. The Conference Presentations USB contains recordings of in-person presentations made at the conference. Material from many conference programs (subject to author permission), including Art Papers, Courses, Panels, Production Sessions, Real-Time Live!, Talks, and Technical Papers. All children must register for the conference, regardless of age. Each paid adult may register up to three children, age 12 and under, at no charge. Children 13 and over will be required to purchase their registration. There are no age-based restrictions to attend the Conference. However, children 17 and under must be accompanied by a registered adult at all times. Unattended and lost children are to be taken to the Conference Management Office until Parents/Guardians can be located. Conference Management staff will notify SIGGRAPH 2019 security and instruct them to advise their staff with respect to the discovered child, as parents will probably approach Security personnel with inquiries. By registering for SIGGRAPH 2019, I agree to abide by any decision of the organizers and event hosts as to any aspect of my participation in this event, including their decision to suspend my participation for any reason whatsoever. SIGGRAPH 2019 complies with the Americans with Disabilities Act and is committed to providing a positive conference experience for all our attendees. If you have special requirements due to disability, you may indicate your needs during the registration process. Please let us know what accommodations you need before 14 June, and SIGGRAPH 2019 will make every effort to fulfill your request. After the deadline of 14 June every effort will be made to accommodate late requests, however, requests received after the deadline will be fulfilled based on availability. To take advantage of discounted registration rates, you must be a member of ACM or ACM SIGGRAPH (Become a member). You must provide a valid 2019 membership ID number at the time you register. Credit will NOT be given if you become a member after registering for SIGGRAPH 2019. To take advantage of student member registration rates, you must be a current, full-time student and a member of ACM or ACM SIGGRAPH (Become a member). You must present identification showing you are a student in 2019 in the form of a school ID or other official documentation from your educational institution. Credit will NOT be given if you become a member after registering for SIGGRAPH 2019. If you need information about a visa, see How to Apply for a Visa. If your visa application requires a letter of invitation from SIGGRAPH 2019, you can request one during the online registration process. When you register for the conference from outside the United States, and your country DOES NOT participate in the Visa Waiver Program, SIGGRAPH 2019 will send you a letter of invitation with your registration materials. 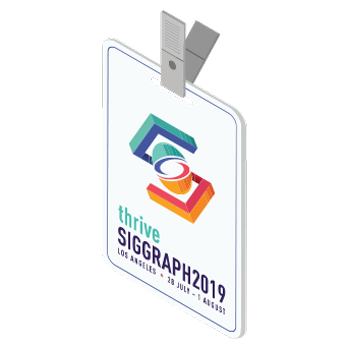 All SIGGRAPH 2019 technical materials and merchandise must be picked up at the conference at Merchandise Pickup. No refunds will be given for items that are not claimed at the conference, nor will unclaimed items be shipped after the conference. Mark your calendars and reserve time for the ultimate recharge 28 July - 1 August, 2019! Conference registration will open March 2019. SIGGRAPH 2019 registration will open in March of 2019. To help you make your planning decisions, you may refer to the pricing for SIGGRAPH 2018. Please note that these prices are for reference only, and 2019 pricing will be posted when registration opens in March.